A home that features a modern farmhouse kitchen design creates a welcoming atmosphere for everyone. A contemporary, farmhouse styled cooking area renders an aesthetic appeal to the whole house. When you design any room with a country touch, it doesn’t mean that everything has to be rustic. A modern tweak can, in fact, give a polished end result — combined with natural elements. When you say traditional, the immediate ideas that come to your mind are shiplap walls, plenty of glass, and striking low-hanging lanterns. And when you say contemporary, you instantly think of solid lines and colors, with a neat layout. Now, when you combine the two, you can get the best of two worlds. This is where our modern farmhouse kitchen design ideas will prove to be useful. 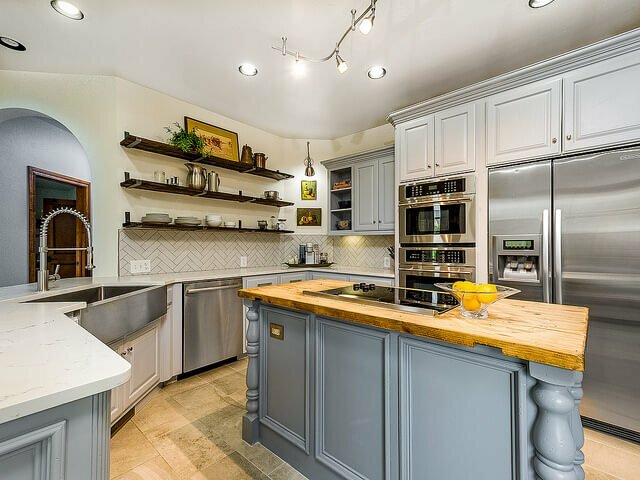 But before proceeding, let’s check out the necessary elements of these types of kitchens — for you to have a better understanding. Modern farmhouse kitchens give you the scope to introduce several variations and options in order to arrive at that perfect balance between rustic simplicity and modern charm. 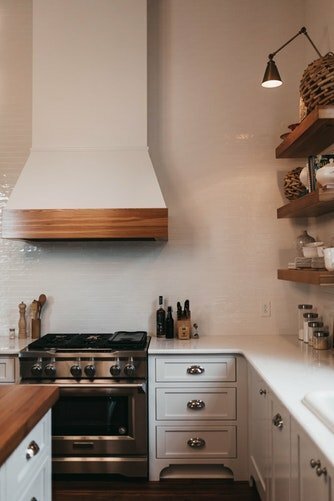 A number of ingredients come together to create that final contemporary-traditional look — such as replacing a subway tile backsplash with a glass tile, sliding barn doors, a tad tarnished hardware, distressed surfaces, old details, and homemade accessories. You can play around with various combinations to suit your personal preferences, lifestyle, and budget. Although there are no set rules for the color palette in a farmhouse kitchen, neutral shades have been seen to be a winner in most homes. 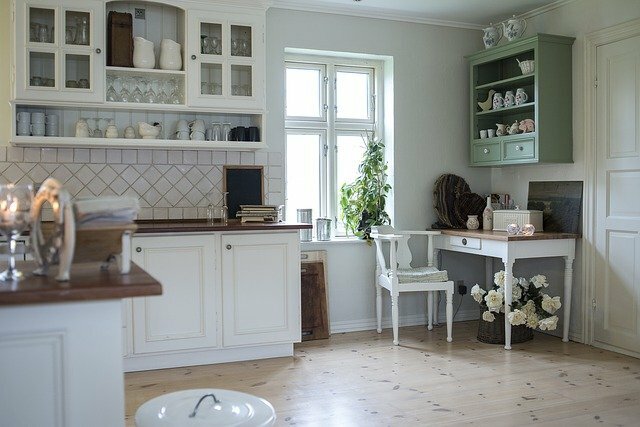 As the set-up of any country-style kitchen is usually light, bright, and airy, neutral colors enhance this feeling further. For example, whites or grays as the base tones will complement the ambiance set by natural light streaming in from the windows. When you choose your lighting and accessories, try to add an industrial or antique touch to the items. The rustic look and rough edges of such pieces will lend a traditional feel to your kitchen. Don’t use them in excess; else, you will make the area look too dated. When your base is neutral, placing furniture and countertops made of materials such as natural wood will result in a whimsical farmhouse design. This will also add a modern touch to your room. Keeping the above factors in mind, let’s play around with a few modern farmhouse kitchen design ideas that you can use in your next remodeling project. So here we go! White always strikes the right chords when it comes to adding some contemporary flair to a country style kitchen. Check the above image out. White cabinets, furniture, and utensils are beautifully complemented by woody table tops and counter tops. A touch of green on the open shelf takes this look further and lends a touch of nature. You can place some potted plants or flowers for adding some finishing touches to the complete layout. This is yet another idea for your kitchen’s interior design that plays with a white color scheme. Real wood shelves, wooden edges, and matching accessories are paired with stainless steel appliances such as a metallic range. The entire setup — complete with an industrial light — gives this kitchen both style and functionality. If you wish to go for a modern farmhouse designed kitchen within a low budget, this is a good option. Modernity blends with age in this black and white kitchen that features a steel range and hood, coupled with a black surface. 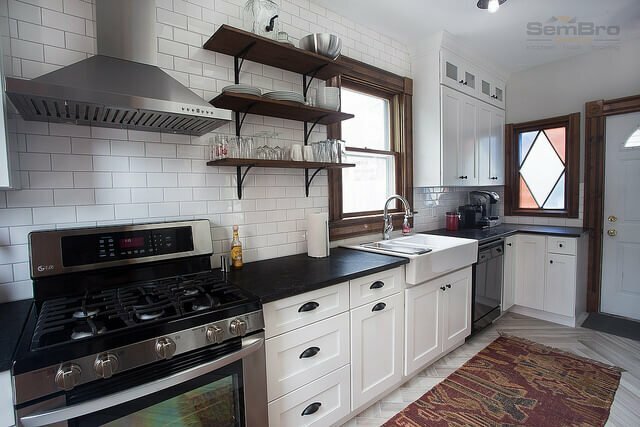 White cabinets, again with black handles, create a striking contrasting effect. A woven rug along with a colored pane lends the required rustic touch to the layout. We love this kitchen remodeled and designed in plain white — augmented with shades of green and fruity colors — that lends an airy, coastal vibe to the whole space. Hanging pendant lights with golden fixtures — complemented with a similar color for the accessories such as faucets and cabinet handles — brings in an antique, traditional touch. The focal point of this kitchen is a spacious, traditional, and royal-looking island with a steel range at the center. The wooden top looks amazing and offers enough space for cooking. Even the steel in-built fridge and oven seem to blend in perfectly. Open shelving, white cabinets, and a huge steel faucet seamlessly entwine all our favorite elements of modern farmhouse kitchen design. Bring in the country farmhouse charm to your cooking space with this design idea. 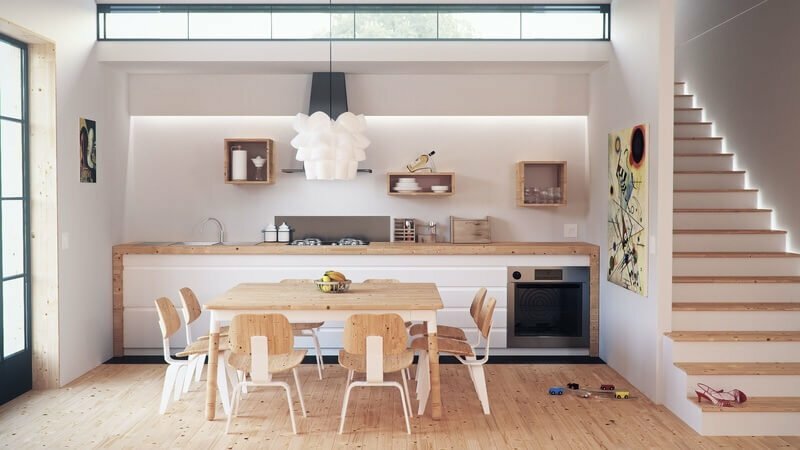 Whitewashed timber wood floors, wooden furniture, benchtops, and cabinetry — all come together in perfect harmony. A wicker basket adds the ideal rustic touch. A little bit of contrast is brought by the wood-colored countertops and a butcher block. A hanging light compensates for limited lighting after dark — because the color palette and window already give lots of scope for natural light to enter and reflect. You can make a small area look much more spacious with this idea. You can never go wrong with exposed beams when you want a country look for your kitchen — as seen in the above design. The natural wood top of the kitchen island and hanging pendants and industrial lights create a fabulous rustic atmosphere. A bit of modern flair is added with plain colored cabinets, sharp and neat edges, and stainless steel range, range hood, and faucet. With plenty of outlets for natural light and a patterned backsplash, your complete modern farmhouse layout is ready. Ideas for modern farmhouse kitchen design need not be too complicated to replicate or execute. They are, in fact, quite easy. If you already have a rustic kitchen layout, just add some contemporary elements to it and vice verse. That being said, let us know which was your favorite idea. We would love you see your views in the comments below!